“Chaired by Professor Medwin Hughes, the Panel of the Independent Review of Support for Publishing and Literature in Wales was tasked by the Welsh Government to give a fully informed and impartial analysis of the publishing and literature sector in Wales. It is a matter of grave (public) concern that the Panel has presented a portrait of Literature Wales – and the wider sector – that is in so many respects inaccurate and ill-informed. Its unaccountably hostile analysis of Literature Wales lacks an evidential base. At the invitation of the Cabinet Minister, Literature Wales has, in a formal submission to the Welsh Government, already offered a detailed commentary on those many areas of the Report that are sub-standard, erroneous, under-researched and troublingly subjective. Further, it is of immense regret that certain cultural commentators (who might reasonably have exercised greater scepticism) have ill-advisedly taken the Report’s portrait of Literature Wales as fact. No doubt they will feel the need to readjust their position in the light of the evidence. The section of the Report that specifically discusses Literature Wales begins with a misrepresentation of arrangements surrounding my own appearance as Chair before the Panel. Full documentary evidence held by Literature Wales in the form of correspondence between Professor Hughes and me clearly demonstrates that I had in fact arranged to meet with the Panel on two occasions. On account of a wholly unacceptable incident at the Panel interview with Literature Wales officers on 23 June 2016 – for which I demanded an apology for the failure of a Panel member to adhere to professional standards – I made it clear to Professor Hughes that, on point of principle, I would not be attending a Panel whose impartiality I considered utterly compromised. I also emphasised that as far as the evidence given to the Panel by Literature Wales officers was concerned, they and I spoke with one voice. An apology was received. It is a matter of regret that I had to ask Professor Hughes twice for his own view of the incident at that June meeting. Having agreed to meet the Panel in the autumn of 2016, I was eventually told by Professor Hughes in a letter of 8 November 2016 that no alternative date for an autumn meeting was possible. These are the facts of the case. In the section of the Report that purports to profile Literature Wales, the Panel goes on to make claims concerning Literature Wales’s governance in the complete absence of evidence. An egregious example of incorrect information marshalled by the panel as part of its cumulatively non-evidenced argument is the percentage of Literature Wales’s budget that is directed to staffing costs. The true figure is 47% – not, as the Review claims, 75%. These are simply two examples; our submission to the Welsh Government, which runs to over 5,000 words, details the full extent of the Review’s failings and poses questions that require answers. The Panel’s conclusions are fundamentally compromised by its inability to report factual evidence and offer an informed, holistic view of the sector. The disjunction between the recommendations and the evidence adduced is another glaring failing of the Report. As Chair of Literature Wales, I refute in the strongest possible terms the Panel’s misinformed depiction of Literature Wales – something that should be of acute concern to the sector as a whole. These misrepresentations are unacceptable in a public document; the sector, and the Welsh Government, deserve better. I have full confidence in my dynamic and diverse Board of Directors and in the excellent and dedicated team of expert staff who share my own vision of literature as a multi-form force for individual imaginative growth and social change. 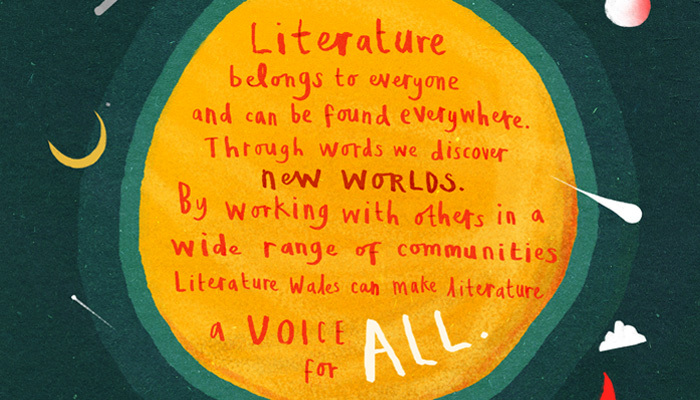 Through literature, and a democratised conception of who has the power and ability to ‘write’, Literature Wales will continue to engage and empower the many, rather than servicing the few.